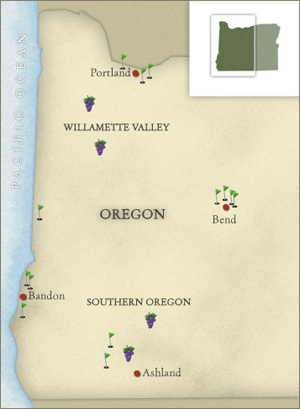 With some of the best golf in the country, world class Pinot Noir and a highly distinguished culinary scene, Oregon is a superlative destination for CORK & TEE golf vacation adventures that offers numerous possibilities to go off the beaten path. For discerning travelers, there truly is something for everyone in Oregon. For the best Oregon golf vacation experience, we suggest itineraries that combine stays in Portland with stays in either Bend or the Southern Oregon Coast.